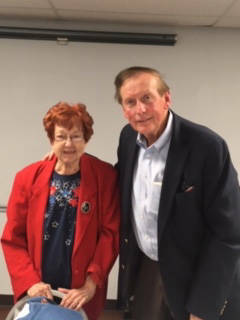 Rheba Burtch and Dan McQuade were honored recently for their 50 years of service as Swanton Public Library Trustees. Two Swanton Public Library trustees were honored recently for a half-century of service to the library. A dinner and recognition ceremony was held at the Swanton Community Center to honor Rheba Burtch and Dan McQuade. Each has been a trustee for 50 years, going back to when the library was still in the Cherry Street high school. Walter said the new board president, Neil Toeppe, had the idea to hold the dinner in their honor. Toeppe said that Burtch and McQuade have seen it all and done it all over their 50 years on the library board. The longtime trustees were presented with letters acknowledging their commitment and will be presented original paintings of the Swanton Public Library. They were also presented Certificates of Recognition signed by Governor John Kasich and Lieutenant Governor Mary Taylor, recognizing their contribution to the library, the community, and the State of Ohio. Burtch also served as board president for 20 years before deciding this year to relinquish the position.